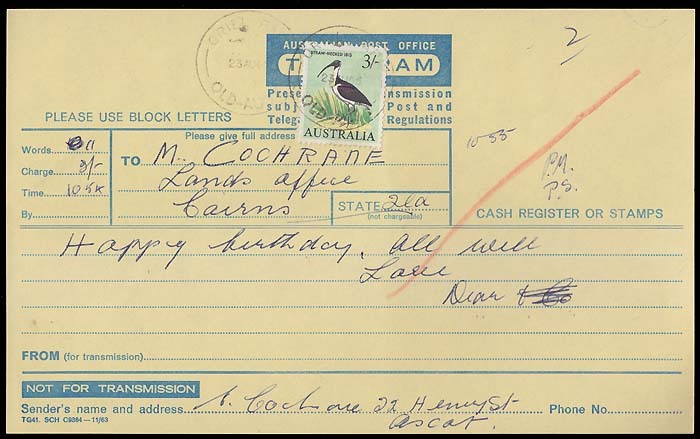 Australia: Australian Post Office period - 1958-1975. Telegrams showing rates: 1958 to 1965. 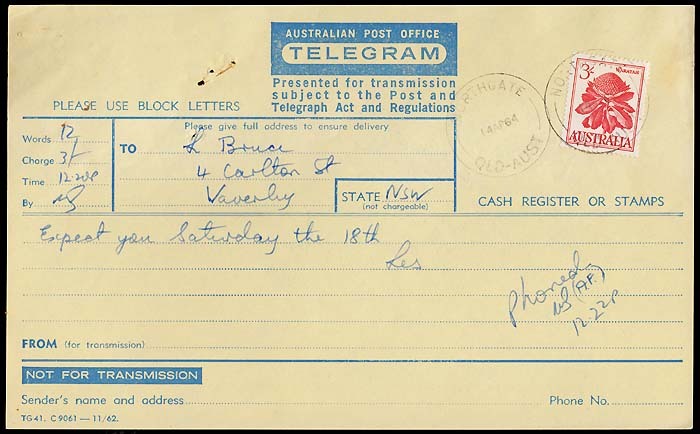 Northgate, Qld to Waverly, NSW (14 April 1964). Single frankng of 3/- Waratah. 12 words costing 3/- is basic telegram rate in this period. Oriel Park to Cairns, Qld. 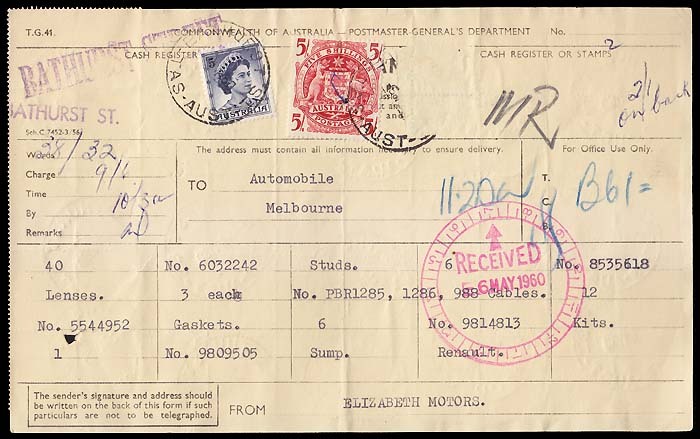 Single franking of 3/- Waratah. 11 words - although 12 words minimum - costing 3/- is basic telegram rate in this period. Banyo Park to Goondiwindi, Qld. 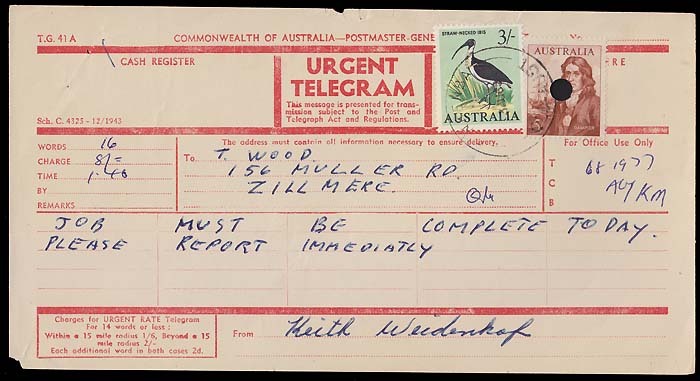 Single franking of 4/- Tasman from the 1964 Navigator series. 15 words plus the State costing 4/-: 3/- is basic telegram rate for 12 words plus an additional 4 words @ 3d per word. Bathurst Street, Tas to Melbourne (6 May 1960). Example of use of 5/- Arms supplemented by a 5d blue Queen Elizabeth II and, on reverse, 50 ½d yellow Kangaroos. A 2/- stamp - presumably the recently released 2/- Flannel Flower - has been removed. 38 words: hence 3/- for first 12 words and 26 words at 3d each (6/6) giving a total cost of 9/6. 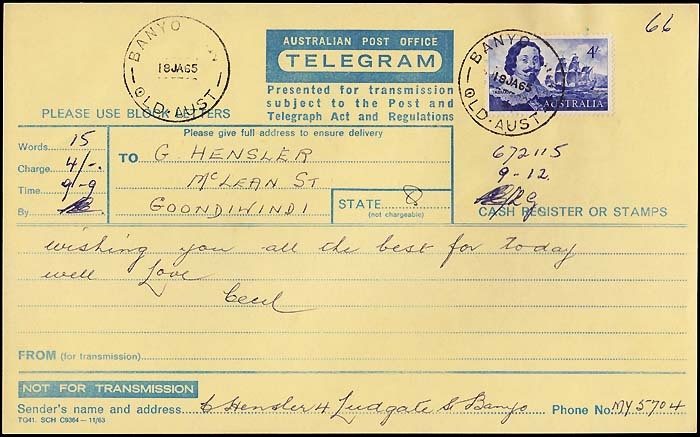 Multiple franking of 3/- Ibis and 5/- Dampier. Very late usage (22 years after printing) but not unusual - newer forms were placed on top of old ones in the Post Offices and hence some old forms had been at the bottom of the pile for many years.